The Rubble was a settlement in the 23 Librae system. It consisted of hundreds of hollowed-out asteroids, moved together and connected by docking tubes, trailing the gas giant Hesiod in the L5 Lagrange point. The Rubble was inhabited by Kig-Yar and Insurrectionists in an uneasy peace, with a large portion of its population made up by survivors from the human colony of Madrigal, which had been glassed by the Covenant. The Rubble also had its own insurrectionist-owned, and rampant AI Juliana. The asteroids that made up the Rubble were first colonized by several groups of humans, primarily insurrectionists, sympathizers, or surviving colonists from the human colony world Madrigal. When the Covenant attack Madrigal, the planet's rebels and insurrectionists gathered up the colonists and evacuated them with freighters and cargo ships. The insurrectionists brought the refugees to the Lagrangian asteroid cluster trailing Hesiod and the Rubble was established. Most of the refugees accepted insurgent ideologies and lifestyles, since they believed it was because of the insurrectionists that they survived. Connected by flexible docking tubes, each of these asteroids had its own means of propulsion, and they were kept together by the machinations and calculations of the smart AI Juliana. She had been operating far past her normal seven year life span and was approaching rampancy, but she had to remain in operation because the tasks that she performed were too difficult for humans. The station was home to several ships that had navigational data that led back to Earth. After the enactment of the Cole Protocol, Spartan Gray Team was sent to The Rubble to eliminate the data. In the end, only one set of data managed to survive this event. At some point after the Rubble's initial colonization, a Kig-Yar vessel passed through Hesiod's asteroid field and discovered the Rubble. As the ship scanned the asteroids and the Rubble's inhabitants considered whether to attack or to flee the system, Peter Bonifacio hailed the craft and came into contact with Reth, one of the Kig-Yar aboard the ship. Bonifacio proposed a trade agreement with Reth. He explained that the humans inhabiting the Rubble were not affiliated with the UNSC, and sent them a manifest of the goods within the Rubble's storage centers. One month later, Reth responded favorably to the proposition, offering Covenant weaponry in exchange for human slipspace engines. Unbeknownst to the residents of the Rubble, Reth had informed the Prophet of Truth of the Rubble's location. Truth sent Reth and a fleet of Kig-Yar ships to trade with the humans in hopes of discovering new human colonies and Earth. However, Truth's and Reth's plot was left unknown to the rest of the Covenant. Meanwhile, the people of the Rubble considered their relationship with the Kig-Yar to be a first step toward peace with the Covenant—they viewed the Human-Covenant War as being the UNSC's fault, and believed that through negotiation, humanity could actually become a client race of the Covenant. However, the Kig-Yar began wanting coordinates to human colonies in exchange for money, power and Covenant technology. Most of the Rubble Security Council agreed that if they did so, their usefulness to the Kig-Yar would be over and the aliens would betray the Rubble and its residents. Bonifacio was still in favor of selling the information to the Kig-Yar, however. He had begun to bribe other Council members to gain a majority vote for selling the navigation data. In case the Kig-Yar betrayed the Rubble, or in case the Covenant or UNSC were to discover the Rubble, the Security Council began working on the Exodus Project, a mass evacuation plan. A member of Gray Team in the Rubble. In 2535, after discovering modified Covenant weaponry originating from the Rubble's system, the High Prophet of Regret declared Reth and his associates to be heretics, and ordered Thel 'Vadamee and his team of Sangheili Zealots to deal with them. Thel and his crew traveled to the system aboard the vessel Retribution's Thunder, along with the Kig-Yar raider A Psalm Every Day captained by Shipmistress Chur'R-Mut and the Jiralhanae Chieftain Pellius. After the Covenant force discovered the Rubble, A Psalm Every Day opened fire on the Thunder; Pellius had decided to seize control of the vessel and betray Thel and his crew, so that he would have the sole honor of finding the Rubble. Thel and his team were subsequently captured and imprisoned in the Rubble's Habitat Pineapple. 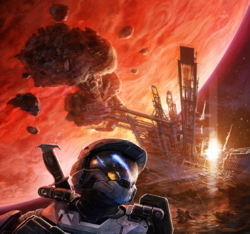 Shortly afterwards, the Rubble was discovered by the UNSC, who sent Spartan Gray Team to investigate it. Later, the Stalwart-class light frigate UNSC Midsummer Night tracked the freighter Kestrel to the Rubble, where they were subsequently attacked and forced to dock with one of the asteroids. The Sangheili zealots escaped imprisonment and managed to steal a Kig-Yar raider. They were able to capture and interrogate Reth. He revealed that the Kig-Yar were following orders from the Prophet of Truth, which confused the Sangheili as they were following conflicting orders from Regret. Reth was able to escape when the Sangheili were distracted and immediately began the preparations of the Rubble's invasion to show that he was still loyal to the Covenant. The Kig-Yar of the Rubble betrayed the humans and planned to attack them with an army of Unggoy that was being bred on Hesiod's moon, Metisette. In response, Juliana ordered the citizens to evacuate into the mobile habitat known as the Exodus Project, and worked in concert with the Spartan Gray Team and the crew and ODSTs of the UNSC frigate UNSC Midsummer Night then used the empty sections of the Rubble to bombard the enemy before they could get all their transports and warships airborne and attack the humans. In the Rubble's final moments, part of it was moved by the AI Juliana into a position which would cause the moon Metisette to collide with it. The Exodus Project was transported via slipspace to the 18 Scorpii system, where it disintegrated to form a debris ring around the colony world of Falaknuma. The Rubble's residents were safely evacuated to Falaknuma. In 2558, Melody Azikiwe remembered that Adriana-111 spent months living undercover amongst the Rubble's residents after meeting Gray Team. The Rubble consisted of numerous asteroids from Hesiod's asteroid belt. The asteroids were linked together by flexible docking tubes which allowed residents to move between asteroids. Airlocks were used to ensure safe traveling between the asteroids. The asteroids themselves were hollowed out. Artificial gravity in the asteroids was created from a rocky cylinder in the center of each individual asteroid that would slowly spin upwards. The Rubble contained many space docks and shipping areas for incoming freighters. Many of the asteroids contained parks, patches of gardens, and trees. Each asteroid fulfilled a purpose. Some provided housing to the Rubble's residents, or was used for military or political purposes. The Rubble was divided between the "Inner Rubble" and the "Outer Rubble". Habitat Korrah was one of the first asteroids colonized and was located at the center of the Rubble. It served as the meeting area for the Rubble Security Council. The Rubble's government was a "technocracy" —an internet democracy—that allowed all of the residents to vote on everything, including laws and its municipal functions. It was governed by the Rubble Security Council. The Council consisted of nine members that were elected by the Rubble's residents. They would allow anyone to become Rubble citizens, although all UNSC military had to swallow a motion tracker in the form of a pill that would allow the Rubble's AI to track their location. They would also have to report for counseling and would be assigned a case officer that would review their integration process. The Rubble's security was operated by the Rubble Security Council that was elected by the Rubble citizens. Though most of the security council was corrupted, there were a few to stand with the UNSC. In the event of Covenant or UNSC discovery, the Security Council had devoted an entire asteroid, Habitat Exodus, for evacuation and escape. The Rubble had no official military force but instead had the Rubble Defense Force, which was essentially a glorified militia. The defense force was controlled by the Rubble Security Council and kept its weapons and munitions on Habitat Greenworthy. The asteroids were also protected by a number of mass drivers as well as a small space fighter force. Due to the many Spanish names given to the residents, ships, firearms, and habitats of the Rubble, it is likely that most of Madrigal/the Rubble's residents are of Hispanic descent.